Here is another request from a reader for a recipe. Yeung Ji Gum Lo 楊枝甘露 is a cold Chinese dessert created by some Hong Kong restaurant in the '80. 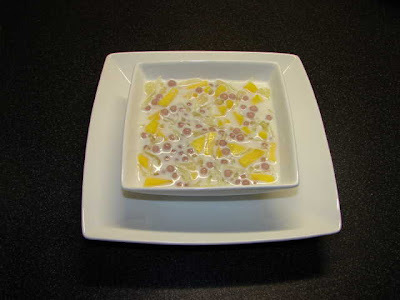 It's quite a refreshing dessert soup which is creamy, sweet and fragrant from mango and pomelo. Very simple to make, all you need is gather the ingredients and mix everything together. The key ingredients are mango, pomelo, sago pearls, mango ice cream and cream/milk. In Hong Kong you can get Mango icecream easily but may be a bit difficult in UK. If you can find some that is great if not can use mango sorbet. Otherwise just use a good vanilla icecream with ripe mango puree. Pomelo is an oriental large grapefruit. In Chinese it is called 柚子 (yu zi). You can find this citrus fruit from Autumn to Winter in most Chinese supermarkets. You may find them in your local Lidl (in UK) from Nov - Feb too, cheaper than Chinese supermarkets. To eat this fruit you need to peel the rind and the skin each segment. Most of the 'honey' pomelos you find in UK come from China and has a sweet and sour taste. For mango best use ripe, sweet and fragrant type. For sago pearls use ordinary or the large type. The picture above I used large yam flavoured pearls which have a light purple colour, it was rather nice. Mix cream/milk with icecream, can use a blender or just let the icecream/sorbet started to melt before mixing. Add fruits and sago pearls. If you like more creamy add more cream or ice cream if not add extra milk to thin it down if you find it too creamy. Add crushed ice if required. If you like it very very thick and creamy, you can add some whipped cream. I find too much cream whipped or single cream is quite sickening, just icecream and full cream milk is good enough for me. This recipe is very flexible, just add any amount of each ingredient the way you like it. Many recipes add sugar I find this unnecessary. If you want to be really posh you can add some cooked bird's nest 燕窩. I don't have a very nice picture to show. The picture above was made long time ago without ice cream I only used cream and milk. Very nice post! I enjoy eating this when I'm in HK at Hui Lui Shan...enjoy you blog also!